Mountain rescue refers to search and rescue activities that occur in a mountainous environment, although the term is sometimes also used to apply to search and rescue in other wilderness environments. The difficult and remote nature of the terrain in which mountain rescue often occurs has resulted in the development of a number of specific pieces of equipment and techniques. Helicopters are often used to quickly extract casualties, and search dogs may be used to locate them.Car of Horská slu ba (Czech Republic)Special stretcher for mountain rescue(Black Forest)Mountain rescue services may be paid professionals or volunteer professionals. Paid rescue services are more likely to exist in places with a high demand such as the Alps, national parks with mountain terrain and many ski resorts. 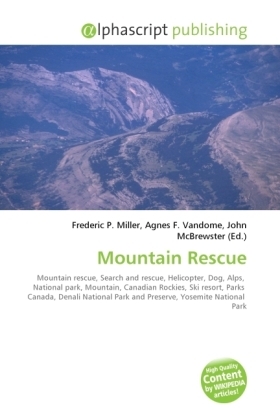 However, the labor-intensive and occasional nature of mountain rescue, along with the specific techniques and local knowledge required for some environments, means that mountain rescue is often undertaken by voluntary teams. These are frequently made up of local climbers and guides. Often paid rescue services may work in co-operation with voluntary services.